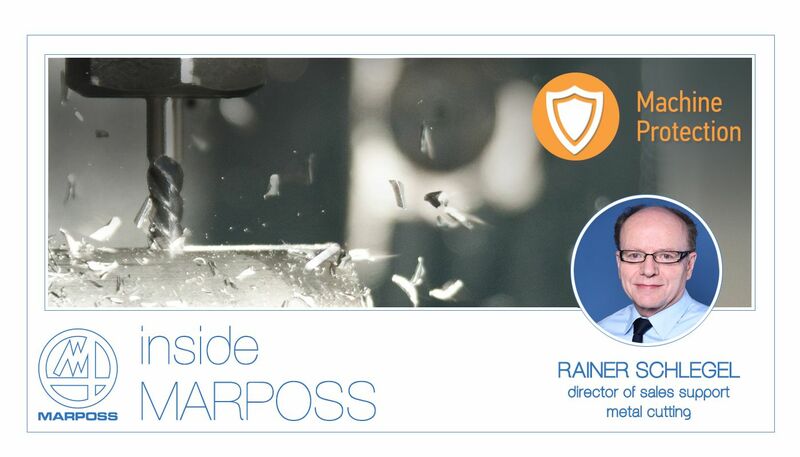 Marposs offers full module-based systems for Machine Protection. In addition to covering the requirements of the manufacturing process, the focus here is on a smart and cost-effective installation and scalability with a uniform operating structure. Many years of experience have been incorporated into innovative, top-class solutions to permanently monitor and improve the availability of machines and equipment. In this way, changes in the performance of the machines can be detected and appropriate measures taken. The Genior Modular CMS02 Machine Protection System from Marposs reliably detects collisions and crashes and can stop the relevant drives immediately. Collisions and crashes that occur in machines, devices or robots can often lead to massive damage with high consequential costs. The extent of the damage can quickly become significant and can lead not only to a component being unusable, but to a crucial part of the machine becoming damaged. The repair is expensive and, above all, production comes to a standstill. The main causes of failure are wear of components and operating errors. Two categories of causes can be identified: geometric collisions (between moving components within the machine), and technological collisions (due to overload situations during the work intervention of the tool cutting edge into the workpiece). Common reasons are wrong cutting parameters, wear or inclusions in the material, but also, as mentioned before, operating errors such as wrong tool or manual movement of the axes. A production machine comes to a standstill and even if an employee reacts immediately, several seconds can elapse before it comes to a final stop. This is often far too long to avoid consequential damage. You have to react quickly! The GEMCMS02 Machine Protection System detects errors immediately and initiates the stop of the axes and spindles. The reaction time is less than one milli-second (<1ms). Damage is drastically reduced or even prevented by using our system. Those using the machine protection system are rewarded by at least one major European insurance company, which offers a 25% discount on the insurance rate because the risk of damage is considerably reduced. The new compact Genior Modular CMS02 Machine Protection System consists of an electronic module, a sensor and a software package for configuration, visualization and data management. Integration into new or existing machines and systems is simple. The module is installed on a DIN rail in the control cabinet or in a field housing. The piezoelectric strain sensor is mounted at a suitable location in the structure of the device. The handshake with the machine control is carried out via IO-connection and can therefore be used independently of control type. Access and data visualization is carried out via the Ethernet connection from a WINDOWS-based system, such as an industrial PC or machine control panel, but can also be performed directly on a SIEMENS TCU (LINUX) controller. Tool-specific limits can be set via the fieldbus modules, which ensure simple tool monitoring ("ToolPlus" function). The GEMCMS02 System was developed for stand-alone use, but can be easily integrated into the ARTIS GENIOR MODULAR Tool and Process Monitoring System. The measurement data is then used in parallel in the dedicated automatic monitoring strategies (MultiCriteria strategies). At least one major European insurance company estimates the risk of damage considerably lower when a GEMCMS02 is installed and grants the operating company a 25 % discount on the insurance policy!